CONCEPT & DESIGN - BASED ON "SIA-CHEAP THRILLS"
I have known Taksh for a while and it amuses me so much to see him jamming to this song. And before you know it, with his hips swaying side to side, fingers strumming his lips, he entertains us with great deliverance and the aura of a musician. We thought no further when it came to picking a concept for his first birthday celebrations. 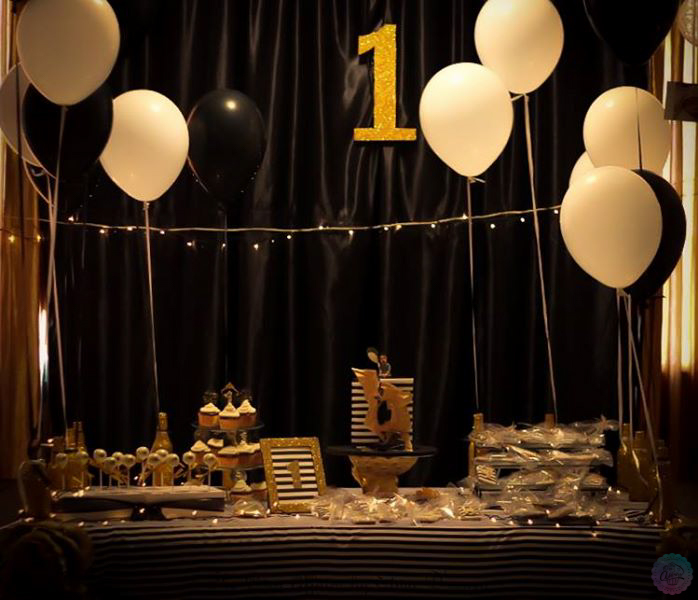 Amidst dazzling lights, glittery bottles, fluffy craftsy pom poms, floating balloons and yarn lanterns lay our sweet goodies to spoil the guests as they wooed at the splendor of black and white stripes embellished in gold all over the place. Created for Ullekh Hegde & Raksha Hegde on the occasion of their son's first birthday. SPECIAL THANKS TO ALL WHO ACTIVELY PARTICIPATED TO PUT THIS SHOW TOGETHER.